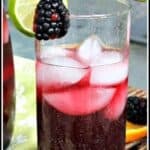 Blackberry Sangria, an easy blackberry sangria recipe with blackberry vodka, red wine, lime, and fresh fruit. A refreshing cocktail and drink! 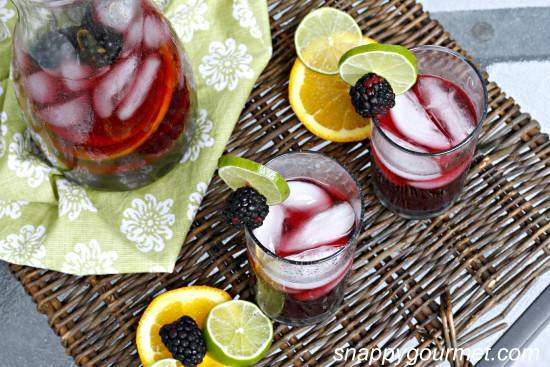 Let’s start the day with a Blackberry Sangria recipe, k? Everyone seems to be moving ahead to fall and fall recipes, but it’s still summer and I wanted sangria. Nothing wrong with that, right??? So I looked around the house to see what I could come up. 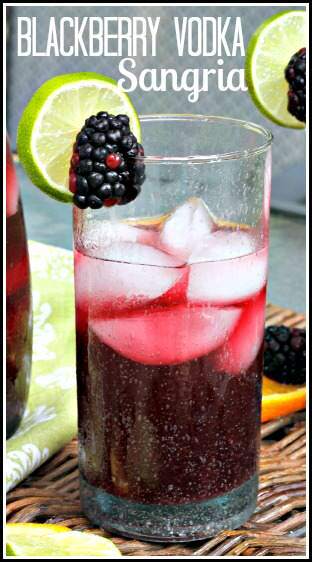 Next thing I knew I was making this simple Blackberry Sangria with vodka and other stuff I had around. It doesn’t take long to put together but you should let the sangria sit in the fridge for at least a few hours or better yet overnight so that the flavor is a bit stronger. 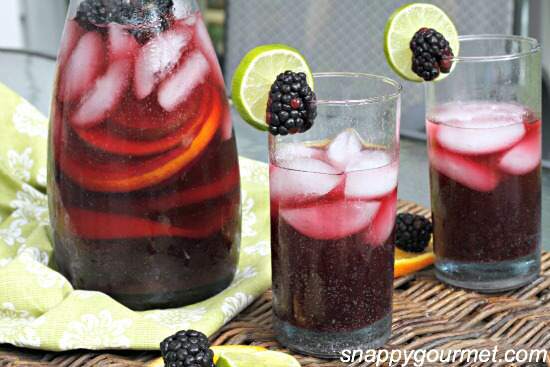 First thing to do for the sangria is make the blackberry simple syrup. 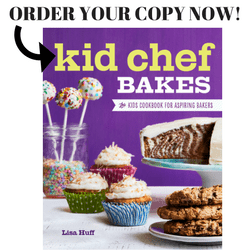 Put your blackberries, water, and sugar in a pan. 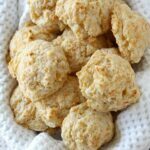 Bring to a boil, then reduce heat and simmer for about 10-15 minutes. 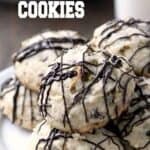 You can add a little more or less blackberries depending on what you have in the house. 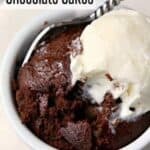 You can also add more/less sugar or water. I didn’t want my sangria overly sweet so I didn’t add as much sugar as most people probably would. 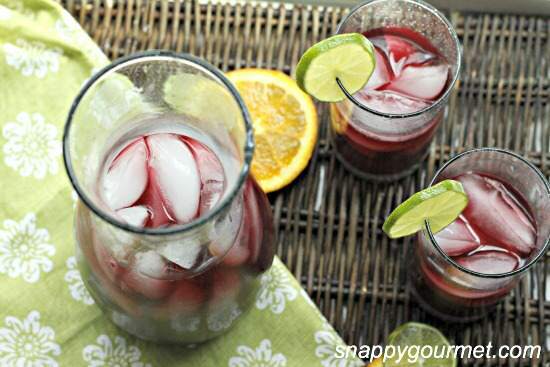 There are a million ways to make sangria so just experiment! 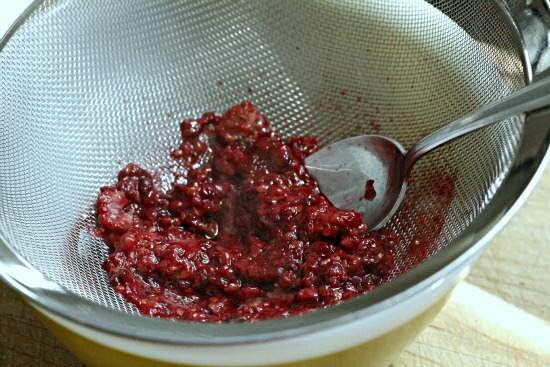 I poured the blackberries through a strainer a few times to catch all the chunks of fruit left. 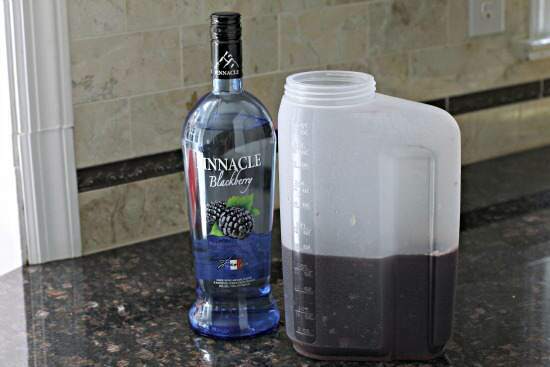 Pour the blackberry simple syrup into a pitcher or container and add your wine. 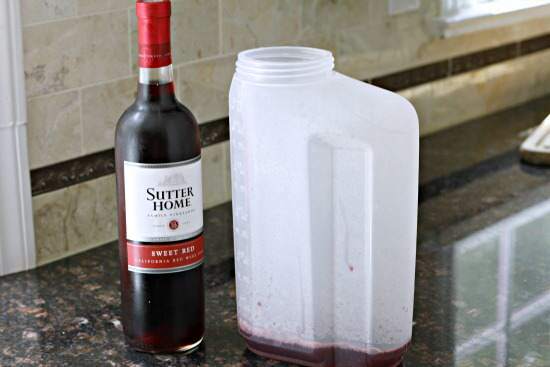 I used Sutter Home’s Sweet Red Wine. Next up was a little Pinnacle Blackberry Vodka. Mmmmmmm…. I added some orange slices, lime slices, and blackberries then mixed it all together and refrigerated overnight. Garnish with more fruit as desired and serve over ice. 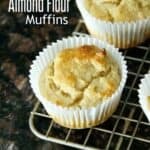 Fall is right around the corner so enjoy now! 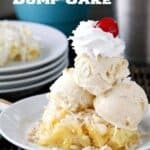 Actually, this would be a great fall cocktail too! 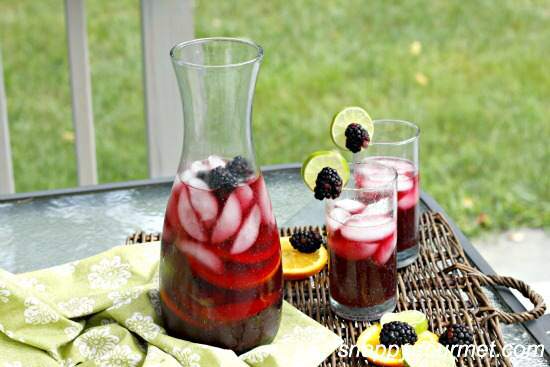 Blackberry Sangria with vodka, a great combo of blackberries and red wine! 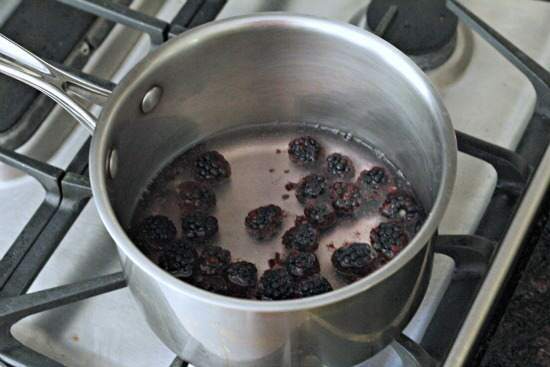 Place 1 cup blackberries, water, and sugar in small saucepan over high heat. Bring to a boil, reduce heat, simmer about 10-15 minutes or until blackberries are very soft. Strain liquid several times and discard fruit. Pour into pitcher. Add wine and vodka. 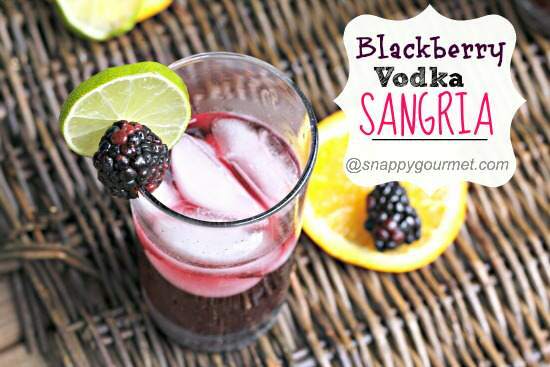 Add orange slices, lime slices, and blackberries as desired. Cover and refrigerate at least a few hours but overnight is desired. Serve over ice and garnish with additional fruit as desired. 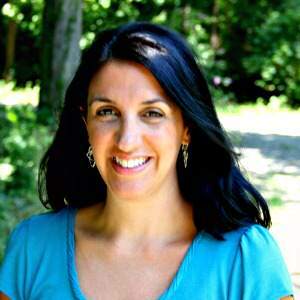 SNAPPY TIPS: Adjust fruit, sugar, and wine as desired for personal taste. I used 1 orange (sliced), 1 lime (sliced), and about 1 cup of additional blackberries for the sangria before refrigerating. SNAPPY SUBSTITUTIONS: Substitute extra orange or lime for the other. Pinnacle Vodka did provide me with some samples of products to try earlier this year but the recipe and all opinions are my own. We used another flavor vodka because we couldn’t find Blackberry…but I’d love to know WHERE people do find the Pinnacle Blackberry Vodka!?! Tracie, our local Total Wine has had it, although I haven’t gotten it in a while. 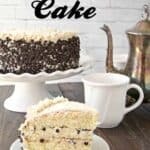 Looks like the Pinnacle website has a store locator you may want to try or some stores will order for you.